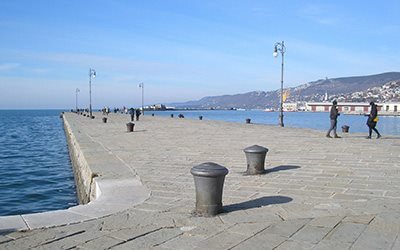 Anecdotes, stories, legends and hidden places in Trieste! The inventor of Confetti Ettore Fenderl was a celebrated nuclear physicist who, in 1926 in Rome, created the first laboratory for research into radioactivity. The White Lady On the cliff that supports the ruins of the old Duino Castle, one can glimpse a white rock that resembles a female figure wrapped in a cloak. The tomb of Charlemagne Legend has it that one night an angel was sent by the Lord to Charlemagne, who at the time was an old and tired king, and told him to travel with a few servants to the valley carved out by the Rosandra River. A Guinness record-setting square An enormous work of graffiti art by Bruno Chersicla put Trieste in the Guinness Book of World Records! In Trieste everyone goes to the beach! Who says that dogs are the only pets you can take on the beach? Trieste...in 3D Discover Trieste... from the comfort of your home!